The smartphone market passed an important milestone in 2013 when worldwide shipments surpassed the one billion mark for the first time, driven by continued momentum from Google Android and Apple iOS. According to the latest global market study by International Data Corporation (IDC), Android and iOS accounted for 95.7 percent of all smartphone shipments in the fourth quarter of 2013 (4Q13), and for 93.8 percent of all smartphone shipments for the whole year. This marked a 4.5-point increase from the 91.2 percent share that the two platforms shared in 4Q12, and a 6.1-point increase from the 87.7 percent share they had in all 2012. "Clearly, there was strong end-user demand for both Android and iOS products during the quarter and the year," said Ramon Llamas, research manager at IDC. What stands out are the different routes Google and Apple took to meet this demand. Android relied on its long list of OEM partners, a broad and deep collection of devices, and price points that appealed to nearly every market segment. Apple iOS, on the other hand, relied on nearly the opposite approach -- a limited selection of Apple-only devices, whose prices trended higher than most. Despite these differences, both platforms found a warm reception to their respective user experiences and selection of mobile applications. While smartphone market growth remained strong in 2013, it should be noted that the era of double-digit annual growth has only a few years remaining. 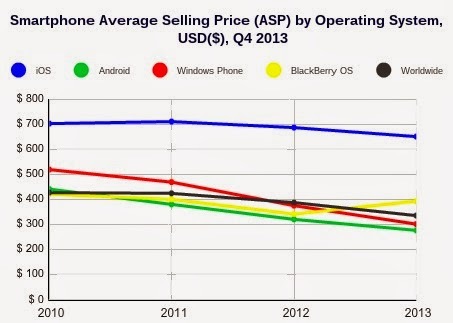 In the meantime, mobile handset vendors are doing all they can to capture demand while it is still present. Worldwide smartphone marketing campaigns continue to stay focused on flagship devices like the iPhone 5S, Galaxy Note 3, and the HTC One -- yet research shows that consumer buying is rapidly shifting toward products with significantly lower price points. In 2013, IDC says that they saw the sub-$200 smartphone market grow to 42.6 percent of global volume, or 430 million units. While the market moves downstream to less expensive smartphone products, it makes sense for Samsung and others to continue their marketing investments geared toward a few high-end products. These efforts build crucial brand perception while having less expensive alternatives that closely relate to these top products helps to close the deal. Samsung has done exactly this with the Galaxy line of smartphones. The product family name is associated with Samsung's high-end devicess, yet there are Galaxy variants offered by Samsung at much lower price points than the Note 3 and S4. This has been an important factor in how Samsung has sustained its market lead. Moreover, it's likely the market development approach that Samsung will use to gain worldwide share at Apple's expense, as more growth is driven by first-time mobile internet users within the emerging markets.